Kanpur: Even the dead are adding big time to the carbon footprint. And the preference of Indian Hindus for conventional cremation in a country of 1.1 billion is only exacerbating the global problem. If you want to burn a body completely, it will 400-500kg of wood, says Kalu Chaudhary, a body-burner at the Harishchandra ghat in Varanasi. “The ritual produces half a million tonnes of ash and also releases 8 million tonnes (mt) of greenhouse gases or carbon dioxide," he adds. Carbon dioxide, a greenhouse gas, is considered to be the single most important cause of rise in global temperatures. Mokshda derives the numbers from UN estimates that 10 million people die in India every year and about 84% of India’s population being Hindu, most of them are cremated. Meanwhile, efforts by environmentalists and the Indian government to promote electric crematoriums, which require no wood, produce no smoke, and leave behind little ash, haven’t caught on beyond a small minority in cities because most Hindus seem to reject the idea due to religious, sentimental, social and, sometimes, practical reasons. If India were to switch over entirely, which is quite unlikely, estimates place the reduction in carbon emissions at up to about five million carbon credits. And in an era of carbon credits that can be traded for real money as part of a growing international tool to fight global warming, these credits alone are potentially worth about Rs6,500 crore. Kanpur, for instance, offers a vivid example of how cremations have become a burden on the living and the environment. Ash and bones lie piled on the riverbank at the cremation ghat, waiting for families to claim them. In the lean months of December to June, ashes simply settle on the riverbed because the river does not have enough water to wash them away. Over the last two years, the problem has worsened because the river was dammed just above the city and during non-monsoon months the city authorities open only one gate to supply water to the city. “As a result, water levels in the river have dropped even more in those months," says Rakesh Jaiswal, director of Ecofriends, a Kanpur-based NGO that has been working to reduce pollution of Ganga. 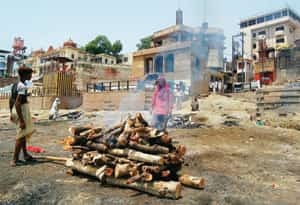 “In summer when it is dry and dusty, there is ash in the air as well," says Manoj Mahapad, a body burner from the dom caste of Kanpur who works at the Bhairav ghat in the city. Placing the ashes into the Ganga is an important part of the death rituals and it is also one of the reasons why electric crematoriums are not popular. Many Hindus believe there are 10 important organs, and for the soul to be completely free, all 10 have to be burnt and the ashes left in the Ganga. “If you burn the body in the crematorium, most of the ashes are lost in the city’s sewage system. You don’t get all of them back. The soul cannot be free then," explains Mahapad, who readily offers this reason to dissuade Hindus who want to use the electric crematorium located next to the cremation ghat where he works. But ashes are not the only reason why Hindus don’t turn to electric cremations. Other rituals, such as mukhagni, in which a fire is lit in the mouth of the deceased, and kapal kriya, where the head of the body is struck open with a stick to release the soul, also cannot be performed in the closed chambers of an electric crematorium. And because “these rituals affect the onward journey of soul, they are a very sensitive issue. All our rituals have gone through a change over the centuries, but this ritual has remained unchanged. In India, from Kashmir to Kanyakumari, language changes, culture changes, dress changes, food changes. But the rituals for the dead remain the same," says Garg. Sometimes, those who want to use the electric crematoriums find that relatives and families disapprove of the suggestion. “When I took my father to the crematorium in Varanasi, my relatives said I have condemned him in his afterlife, that I did not even give him wood for his final journey," said Sunil Sharma, a resident of a village outside Varanasi. Then there is the severe power crisis that cities such as Kanpur face, forcing crematoriums to close down for several hours every day. “When there is a dead body you are carrying, you want to dispose it immediately. No one wants to prolong the process. It is too painful for the family," said the crematorium operator at the Bhairav ghat in Kanpur. He has worked there for 25 years, but refused to give his name because “officials do not like us to talk to reporters". In cities, however, higher education levels are helping somewhat mitigate the issue. Yet, even places such as Bangalore, a city of 5.3 million people, has just eight electric crematoriums. A.K. Gopalswamy, engineer-in-chief at the Bruhat Bengaluru Mahanagara Palike, a government body that runs electric crematoriums in Bangalore, says about 40-48 bodies are brought to electric crematoriums compared with 8-16 bodies every day that are cremated using wood pyres. Sometimes—and it is rare—families of the deceased are told to wait for several days for their turn at an electric crematorium. But unlike Bangalore, Chennai or Mumbai, in the rest of India, typically two categories of bodies end up in electric crematoriums: unclaimed bodies of the poorest Indians that the police disposes of, or the very well-educated who do not believe in ritual practices. “Unfortunately, most of India does not fall in either category," said Garg. Mokshda has received $1 million (Rs4.87 crore) from the United Nations Development Programme to expand its environmentally friendlier cremation system that needs just 100kg of wood and burns the body in less than half the time. Since the technology is still wood-based and allows important rituals to be performed, Mokshda hopes it will convince more Hindus to accept it. “This month, we will begin implementing our expansion plans in 10 cities of Mumbai, Kolkata, Bangalore, Chennai, Jaipur, Ahmedabad, Hyderabad, Chandigarh, Haridwar and Allahabad," Garg said. The organization is also talking to the ministry of environment and forests and international organizations to register its technology as a clean development mechanism. This recognition allows a country to start earning carbon credits for its use. “Many corporates have expressed interest in funding these crematoriums as a part of their corporate social responsibility. We are talking to them right now," claims Garg. But even he concedes it won’t be easy. “It will take a lot of convincing. This is a matter of faith and nothing can be imposed on people." Poornima Mohandas in Bangalore contributed to this story.